The Corvette Club of Battle Creek (CCBC) is a non-profit organization that has been in Battle Creek uniting Corvette drivers and promoting America’s finest sportscar. We’ve been around for 54 years, making us one of the first Corvette Clubs ever and one of the founding clubs of National Council of Corvette Clubs (NCCC). And this is just what the CCBC puts on! We also participate in local events put on by other NCCC clubs in our region for points; including low-speed precision driving events, high-speed races, driving schools, and more. We participate in car shows put on by other clubs and the community. Our annual car show, the Corvette Celebration, is one of the best-established car shows in Michigan; and one of the largest Corvette-only shows in the entire region. 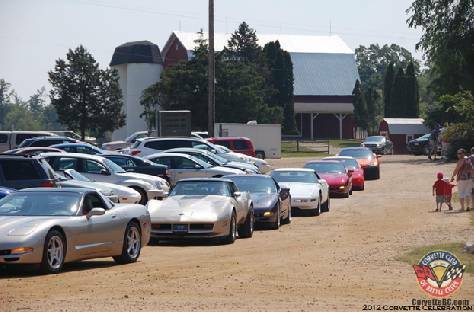 For over 24 years, Midwestern Corvette owners have saved the Sunday after Mother’s Day to come up to participate in the show! Everyone shows off their slick rides, enters a 50-50 raffle for charity, reunite with friends after a long winter, enjoy food fun and frolics, and often go home with one of our fun door prizes to go along with the free goody bag that the first 200 attendees receive. We’ll be updating about our 24th annual Corvette Celebration soon! The CCBC membership joins together every first Wednesday of the month to talk about planning these events, the national Corvette scene, and items of Corvette interest. If you’re interested in joining and enhancing the fun of driving your Corvette, learn more about the joys of being a member, find out how to join (click here).